A ban on plastic carrier bags has come into force in Kenya, which means that anyone found selling, manufacturing or carrying them could face fines of up to $38,000 or prison sentences of up to four years. Kenya's ban is seen as one of the toughest in the world, although officials say that for now, ordinary shoppers will be warned and have their bags confiscated. Animals often graze on the rubbish and the United Nations' Environment Programme says huge amounts of polythene bags are pulled out of livestock in Nairobi's abattoirs - as many as 20 bags per cow - raising fears of plastic contamination in beef. Kenya's Environment Minister Judy Wakhungu says the plastic bags take between 20 and 1,000 years to biodegrade. 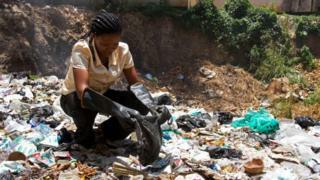 "Plastic bags now constitute the biggest challenge to solid waste management in Kenya. This has become our environmental nightmare that we must defeat by all means," she told the BBC. Kenyans are slowly getting used to carrying their shopping using bags made from materials other than plastic. At a local supermarket, I saw a man stuff a bunch of unwrapped spinach into his backpack. Other customers bought bags made from fabric for 10 Kenyan shillings (10 US cents; 7 British pence). The $38,000 fine with the alternative of a four-year jail term has many people preferring to comply with the ban. The National Environment Management Authority (Nema) says that enforcement officers can, for now, only confiscate plastic bags but not arrest offenders. Reports say traders in the city's main meat market are still using plastic bags. Others say people are using old sacks, newspapers and envelopes. When these are not available, consumers are said to be carrying their goods with their bare hands. Travellers coming into Kenya with duty-free plastic shop bags will be required to leave them at the airport under the new rules, Nema has said. 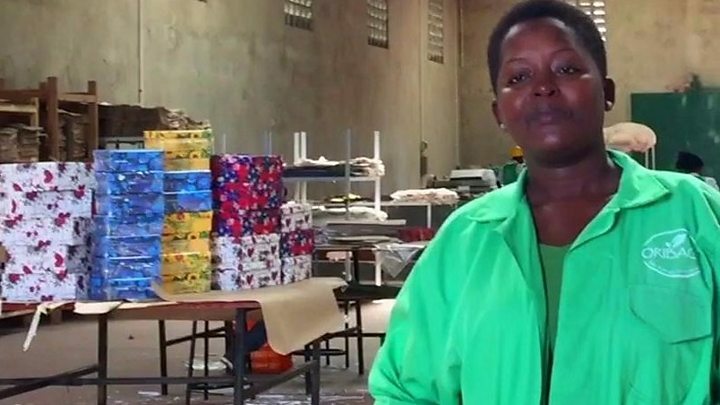 Media captionWhen Uganda banned plastic bags, Rusia Orikiriza spotted a business opportunity. This is the third attempt in the past 10 years to ban plastic bags in Kenya. The government had given a six-month window for adjustment which expired on Sunday night. In its ruling last week, the High Court dismissed a case filed by two plastic bags importers urging it to drop the ban. The court ruled that environmental concerns were more important than commercial interests. Research in Europe has shown that a paper bag must be used three times to compensate for the larger amount of carbon used in manufacturing and transporting it. Likewise a plastic "bag for life" must be used four times, and a cotton bag must be used 131 times. What should be done about plastic bags?